But working longer won't make much of a difference if they're paying off debt. A shocking number of Canadians in the generation closest to retirement have no money saved for their golden years, according to a new survey. The study, which was conducted for Franklin Templeton Investments Canada, found that one-fifth of pre-retiree Canadian baby boomers have put away nothing for retirement. The survey defined baby boomers as those ages 53 to 71, which closely matches Statistics Canada's definition of that generation, those born from 1946 to 1965. And considering that nearly a third of Canadians were identified as baby boomers in 2011, a large number of people are approaching their years away from the workforce with no savings. More than a third of retired baby boomers in the Franklin Templeton survey opted to leave the workforce later because they didn't have enough money, a practice that is becoming increasingly common. And while working longer might seem like a good solution, especially if you're healthy and you enjoy your job, it means little for your retirement if you're only servicing debt, which is the case for many people. Among boomers who either didn't take full advantage (or were unaware of) the contribution limits in their registered retirement plans, nearly 30 per cent said they were focused on paying off debt instead of saving for retirement. The average Canadian owed $22,837 in the fourth quarter of 2017, according to a report from credit agency Equifax, an increase of three per cent over the year before. 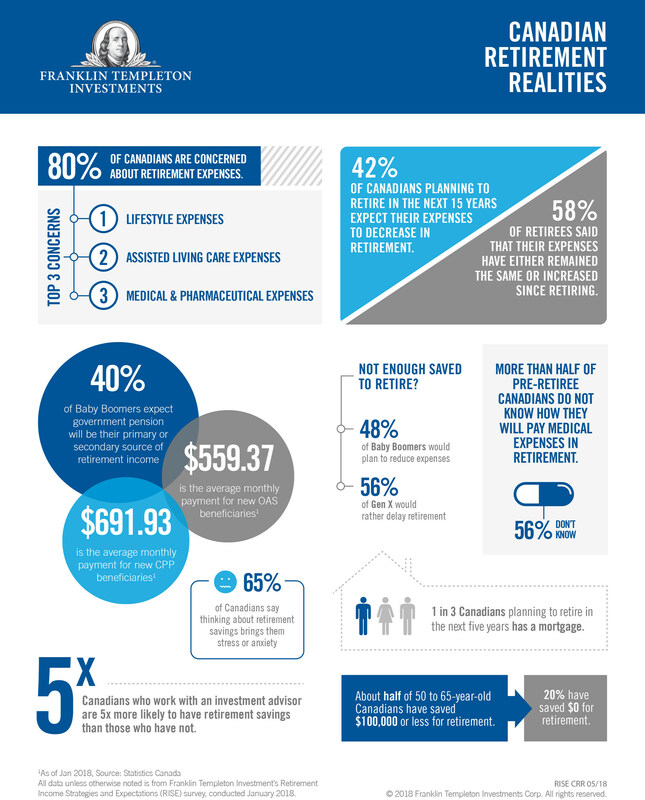 An infographic from Franklin Templeton Investments shows that about half of Canadians aged 50 to 65 have $100,000 or less saved for retirement. Three-quarters of the pre-retiree baby boomers surveyed said they felt anxious or stressed about their retirement savings or investments, and 40 per cent said they expected to rely on a government pension as their primary or secondary source of income. And that may end up being the case; half of those people surveyed who had already retired said their government pension was their primary or secondary source of income. Baby boomers who contribute to the Canada Pension Plan can at least bank on receiving more money in the coming years. Starting in 2019, the CPP will start to grow to replace one-third of your average work earnings, up from one-fourth. But the higher benefits will also come with higher contributions. And all hope is not lost if you're a cash-poor boomer. T.E. Wealth has some good tips, including socking away occasional infusions of money like tax refunds and raises, getting a side gig if you can, and ensuring you have insurance to deal with unexpected events.